Diagnosed with binge-eating disorder, a Boise DJ takes on a very public battle with obesity. He's looking for a little help from his friends, and maybe even from some legendary rockers. Boise radio DJ Jeremi Smith, also known as Big J, says his relationship to food is like an alcoholic's relationship to drinking. "Imagine being an alcoholic in recovery, but to stay alive you have to have a drink every day," he says. Diagnosed with binge-eating disorder, Big J says he's addicted to food like some people are to booze. The difference, he says, is that he can't just get on the wagon and stop eating food. Every time he sits down for a meal, he must not only face his addiction, he must give in to it—but only a little bit. It's like putting a drink in front of an alcoholic three times a day, but telling them they can only have a sip. "Every meal's a challenge," he says, "and it's exhausting." Big J is looking for support by taking his weight-loss battle into the public sphere with his new social media campaign. The campaign will follow his attempt to lose at least 100 pounds by November 28, 2018. That date may sound random, but it's not. 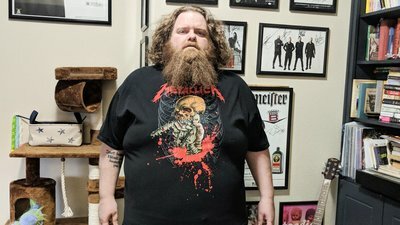 It's the day his favorite band, Metallica, comes to Taco Bell Arena in Boise, Idaho, for a gig. As part of his campaign, Big J will create a series of videos that track his diet progress. He's already sent a link to his first video to Metallica. In the short video, he asks the band for two favors: permission to use the hashtag #metallicadiet in his posts, and the chance to interview the entire band when they come to town. Although he says he doesn't expect to have either of what he calls his "unicorn asks" granted, he still thinks it's possible. He's a popular DJ—albeit in a small market—and has previously interviewed the band's bass player and vocalist, Robert Trujillo. Metallica responded to his request with a video of their own, accepting his challenge. After constantly struggling with his weight for years, Big J was finally diagnosed with binge-eating disorder. The American Psychological Association (APA) defines the disorder as "recurring episodes of eating significantly more food in a short period of time than most people would eat under similar circumstances, with episodes marked by feelings of lack of control." The APA says binge-eating disorder affects about 2 percent of the general population and 8 percent of people who are obese. Big J has established several goals for his social media campaign: He wants to make his weight-loss efforts public so he'll feel more accountable, he wants to educate others about the disorder and how to treat it, and he wants to give people who suffer from it the opportunity to speak publicly and share lessons they've learned. As part of his weight-loss plan, Big J says he'll be taking an over-the-counter drug called human chorionic gonadotropin (HCG). He has taken the drug in the past and lost more than 200 pounds. In men, HCG is responsible for testosterone production. In women, it serves as what is known as a "pregnancy hormone." If the mother is unable to provide the fetus with all the nutrition it needs, HCG allows the fetus to draw from the mother's fat stores. Proponents say HCG can serve the same function as part of a weight-loss program, enabling the person's body to draw on fat stores for energy. Along with an exercise program and the support of friends and listeners, Big J hopes HCG will work for him again so he can lose at least 100 pounds by the time the band arrives. But, as he sits down and faces each meal, it'll all come down to "The Struggle Within." You can follow Big J's progress on his Facebook page. Rabe, T., Richter, S., Kiesel, L., & Runnebaum, B. (1987). Risk-benefit analysis of a hCG-500 kcal reducing diet (cura romana) in females. Geburtshilfe und Frauenheilkunde, 47(5), 297-307. Lijesen, G. K., Theeuwen, I., Assendelft, W. J., & Wal, G. (1995). The effect of human chorionic gonadotropin (HCG) in the treatment of obesity by means of the Simeons therapy: a criteria‐based meta‐analysis. British Journal of Clinical Pharmacology, 40(3), 237-243.